available with lowboy trailer options. 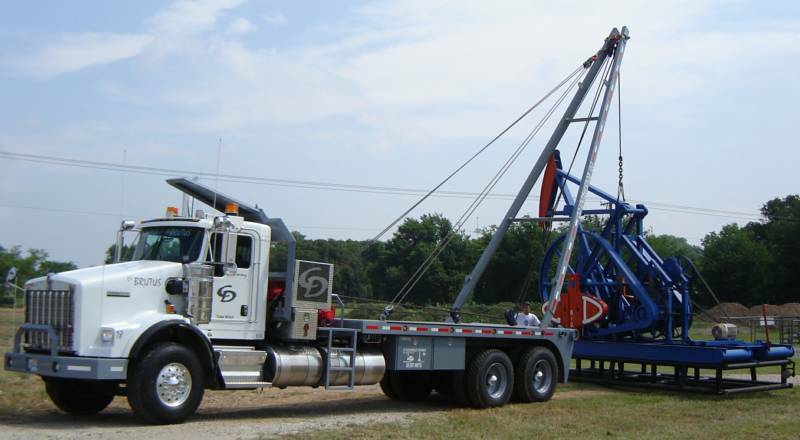 Trucks are used to move, set, or repair pumping units; move drilling rig equipment; or a variety of other heavy duty transportable lifts. Up to 17,500 lb. loads may be transported with our variety of hotshot truck/trailer combinations. Trailer options include a 45 ft. deck gooseneck. Trucks vary from 1 ton dually trucks to trucks with medium duty trucks with 17,500 lb. GVWR. Service is available 24hrs a day. Whether it is monitoring well production following a frac job or blowing down prior to workover, we provide labor and equipment to flow back gas wells. Security needs can be addressed with the use of gate guards. We provide 24 service to monitor and record all traffic in and out. Sign-in and sign-out service is available. We provide equipment and personnel to meet state and local requirements to safely regulate traffic flow. Our equipment includes proper signage, flagging, lights, cones, handheld radios, and vehicles. Portable signs warn drivers of "Trucks Entering Roadway", "Flagmen Ahead", and "Be Prepared To Stop". ment ditches around drilling rigs. regulated by state and local regulations as well as landfill restrictions. 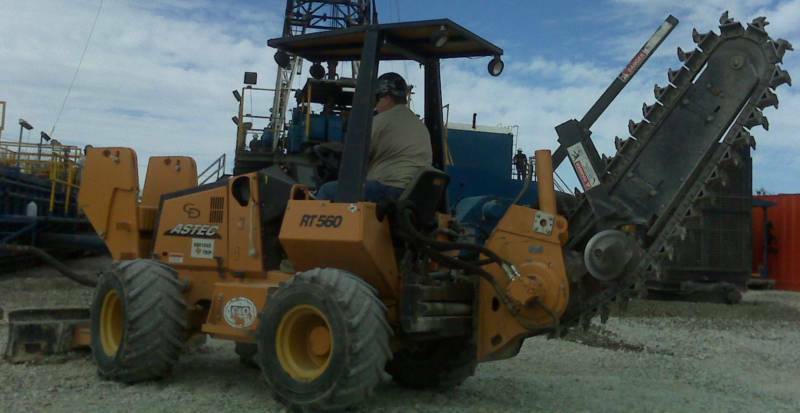 List of equipment includes 3 backhoes: Caterpillar Model 420C and 2ea - CAT 416C. CAT 312 trackhoe w/ std bucket or clean out (muck bucket). Available hourly with operator or long term lease w/o operator. We offer a CAT D6-M dozer. It is equipped with a 6-way blade and winch attachment. A John Deere 6410 tractor is equipped with a hydraulic boom mower. This configuration can be used with to clear vegetation growth along roads, fencelines, right-of-ways, and other hard to access areas.